Princess Leia is many things. She’s a soldier, fighting alongside the troops of the Rebel Alliance. She’s a senator, using her voice to speak on behalf of the voiceless. She’s a spy, gathering Imperial secrets to give the cause of light as much of advantage as it can get during dark times. But above all else, Princess Leia is a leader. Through her words, deeds, and seemingly superhuman ability to persevere in the face of overwhelming opposition, she directly and indirectly inspires hope, as well as action, on multiple occasions. If we’re fortunate, the children in our lives will grow into adults who have a similarly empowering effect on the people around them. Encouraging such leadership is at the center of this Star Wars Galaxy of Adventures guide. 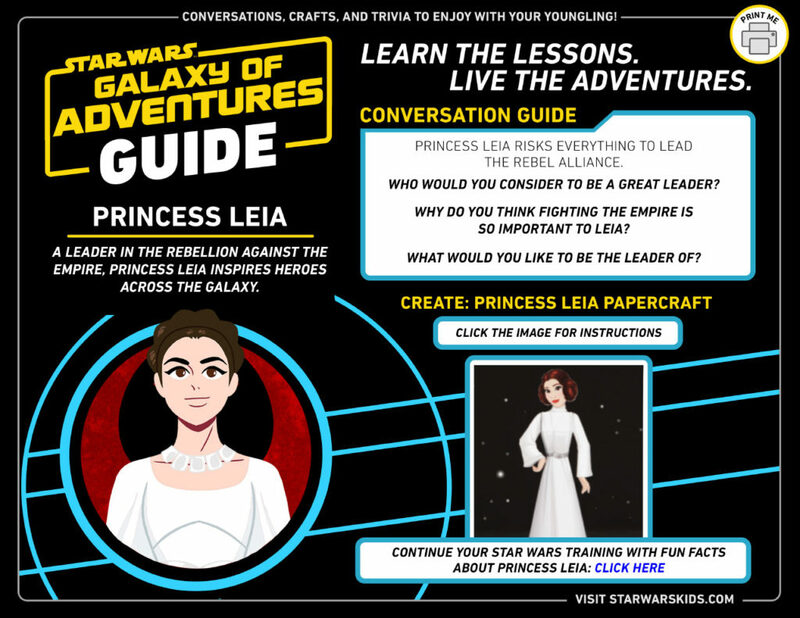 Using Princess Leia’s heroism as seen in “A Fearless Leader,” it offers you conversation starters with which you can begin to explore the concept of leadership with your own young freedom fighters. Also included are instructions for a papercraft honoring Princess Leia, as well as a link to Galaxy of Adventures Fun Facts containing even more information about her story. When Leia first meets the young Ewok, Wicket, she’s in a war zone: her team has been separated trying to find the Death Star shield generator, and she’s dazed from a speeder bike crash. But instead of reacting defensively or being hostile toward Wicket, Leia offers him some food — a surprising expression of peace. 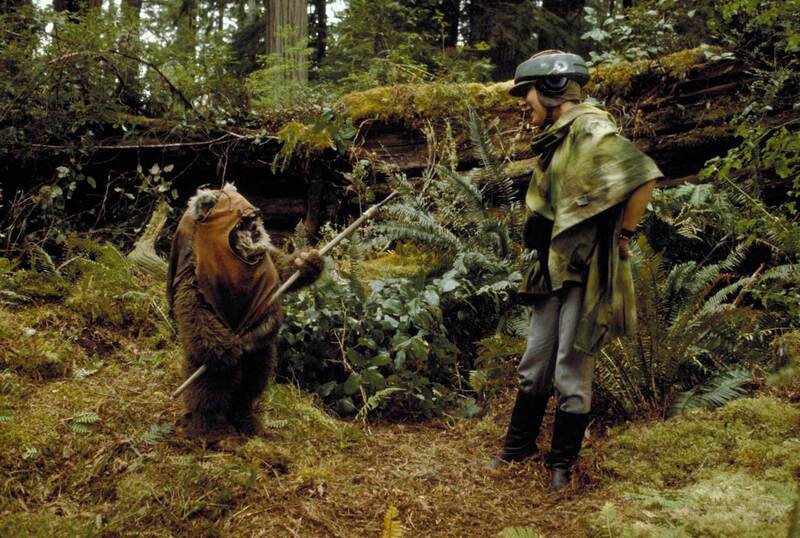 And Leia’s diplomacy pays off later when the Ewoks help the rebels take the shield generator down. Themes of giving to others can often be lost in the larger story of Star Wars, but as Yoda says, wars not make one great. It was arguably Leia’s act of kindness toward the Ewoks that changed the course of the Galactic Civil War. As the holiday season approaches and we reflect on the power of charity and compassion, we take a moment to consider what the Skywalker twins can teach us about light and charity in our everyday world. Leia’s understanding of the practical work involved in bringing hope and light to the people around her began early. In the novel Leia, Princess of Alderaan, she trained as a politician and followed her adopted parents’ lead in resisting the most overt cruelties of the Empire. She soon discovered that by paying attention to people she could do the most good, an understanding that, along with her ferocity and determination, guided her as she continued on her journey to join the Rebellion. Bail and Breha Organa gave their daughter a strong foundation in resistance. Bail worked inside the Senate to try to soften the Empire’s edicts. Although this didn’t work in the long run, it did lay the groundwork for Leia’s training in rebellion so she could become the person who would eventually deliver the stolen Death Star plans. After Leia’s adopted family perished, she had her twin to lean on — even if the Skywalkers didn’t know they were siblings yet. Luke and Leia support one another in A New Hope as soldiers-in-arms. Both twins are caught up in the adventure and fear of their fight against the Empire. But their hope is not crystallized in the moment of triumphant destruction of the Death Star, with Leia overseeing the battle and Luke firing the shot into the thermal exhaust port. It’s the jubilant and victorious hug shared between Luke, Leia, and Han that solidifies the trio as a team that will carry the weight of the galaxy between them. Leia’s smile at the end of A New Hope is another of the most joyful moments in the trilogy. It shows her love for her friends and her joy that the rebels are becoming a force to be reckoned with — just as her adopted parents wanted. Luke also has a strong moral stance that was instilled in him by his adopted family. 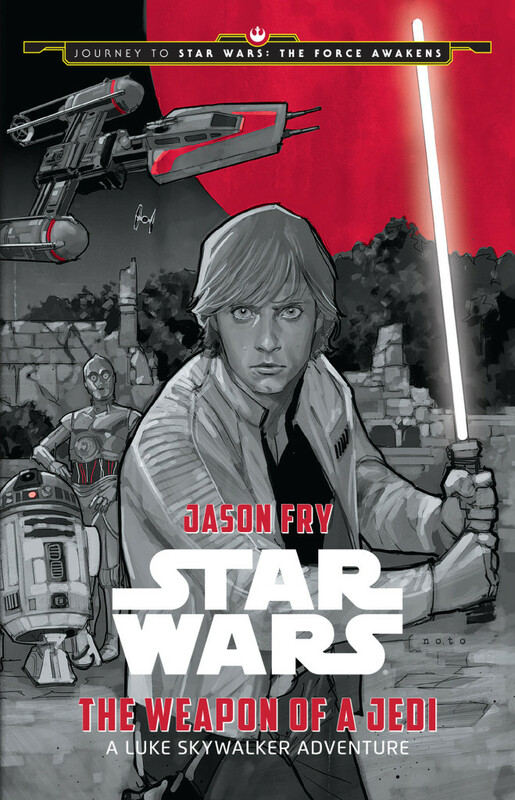 After A New Hope, his next step into the world of the Jedi teaches him what hope means to users of the Force. In the novel The Weapon of a Jedi, Luke faces off against Sarco, a bounty hunter who values the physical artifacts the Jedi left behind. Luke understands that knowledge is more important than treasure, and also that friendship is essential to hope. “The Force brought me here,” Luke thinks. “And what I learned here saved me.” Luke sees that his victory at the Death Star was just one aspect of his responsibility as a Jedi: he must build up as well as destroy. In The Empire Strikes Back, the galaxy becomes a more difficult place to hold onto hope. Everyone is tested over and over — for every victory something is lost. Warmth in The Empire Strikes Back comes in part from the twins’ connection to each other; they lean on each other after Luke loses his hand and Han is captured, brought together by their shared tragedies. The importance of family is found in the gentle comfort between Leia and Luke. In Return of the Jedi, when Luke reveals that he and Leia are twins, they begin to understand how they connect as siblings. Leia’s role in the fight could have been through her martial prowess — she knows how to coordinate an army, after all — but instead becomes a story about charity and how giving to the Ewoks leads to success for the cause. The return of the Jedi is also a return of hope, a fulfillment of the promise the Skywalker twins showed all along. The victory celebration is a festival of life and light, with fireworks there echoed all across the galaxy. The war isn’t completely over; every season of hope is eventually followed by a season of darkness. But for now, the Skywalkers and their companions have won. The cycle keeps turning, reminding both the audience and the denizens of the galaxy far, far away of the power of charity and hope in the cold darkness.